I am well into Chapter 5 of part 3 and I'm amazed. What a life. How has he lived long enough to tell this story? With his love of making music, he has overcome self-debasement and simply had to survive to tell all of this. There is candor and risk and success and error. His addictions and the tragedy of Gram Parson's are intertwined and troubling. He is accused of misogyny, but I don't hear him promising more than he gave and I'm not certain he treated anyone worse than himself. I'm glad he told it as it was instead of some tidy, self-reverential, cleaner version. Oh, and he could care less about redemption, he's been too busy living. I was jarred and confused when the narration went from Depp to Hurley. Both are excellent, but I don't like the inconsistency of voice and if I could choose between the two, I'd choose Hurley's narration. Hurley has the growl and the grittyness and the laugh and the accent just right. This is a book to be listened to, a tale told brilliantly in the large smoky living room of an old, musty faded-glory house, perhaps in France. 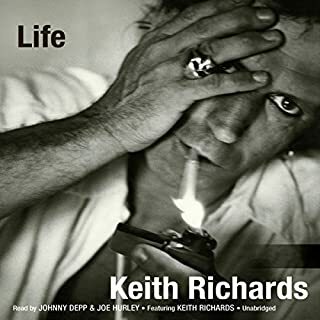 Keith, thanks for letting me sit on the floor as you shared your life so far with all its wonders and warts.